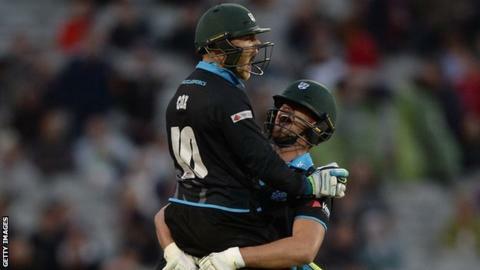 Worcestershire have improved their chances of reaching Twenty20 Finals Day for the first time by booking their first home quarter-final. They earned a home tie at New Road (on a date to be decided, on 12, 13, 14 or 15 August) thanks to Birmingham Bears, their Midlands neighbours. The T20 Blast holders, already in the last eight, secured their own home tie with a one-run win over Northants. But a third quarter-final in five years for Worcestershire is more noteworthy. Steve Rhodes' side have made it to the last eight four times since the quarter-finals were introduced in the second year of T20 cricket in 2004. But they have never before had home advantage, losing twice to Surrey at The Oval (2004 and 2014), as well as being beaten by Gloucestershire at Nevil Road, Bristol in 2007 and Yorkshire at Headingley (2012). Worcestershire and Derbyshire are the only counties not to have appeared on Finals Day in the 12 previous summers of Twenty20 cricket in England. "We'd love to think we could get to Finals Day, "said Worcestershire director of cricket Rhodes. "But we won't get too carried away. "It's great for the players and the club to get a home quarter-final but it's very much one game at a time." Worcestershire still have to complete their programme of fixtures at New Road on Friday, when they host a Lancashire side currently fourth in the North Group and needing to win to ensure they also make the quarters. "Lancashire will be a tough proposition," said Rhodes. "They've got a guy in James Faulkner who was man of the match in the World Cup final. He is a tremendous cricketer." But Faulkner was dealt with when the two sides met at Old Trafford last month, Ben Cox swinging the Australian all-rounder over wide mid on for six as Worcestershire won off the penultimate ball. The home side will be without New Zealand all-rounder Colin Munro, who has been called up for one-day international duty in Zimbabwe and South Africa. He not only misses the Lancashire game, but will miss the quarter-final and, should Worcestershire get there, Finals Day too. Reigning champions Birmingham, who scraped into Finals Day with a fourth-place group finish followed by an away quarter-final win against Essex at Chelmsford a year ago, booked their home quarter-final by winning Wednesday's last-ball thriller against Northants at Edgbaston. Set a target of 154 for a victory which would have booked their own place in the last eight, Northants needed 23 from the final over, bowled by Recordo Gordon, and almost got them. New Zealand captain Brendon McCullum, in his last home game for the Bears, was dismissed for 26.